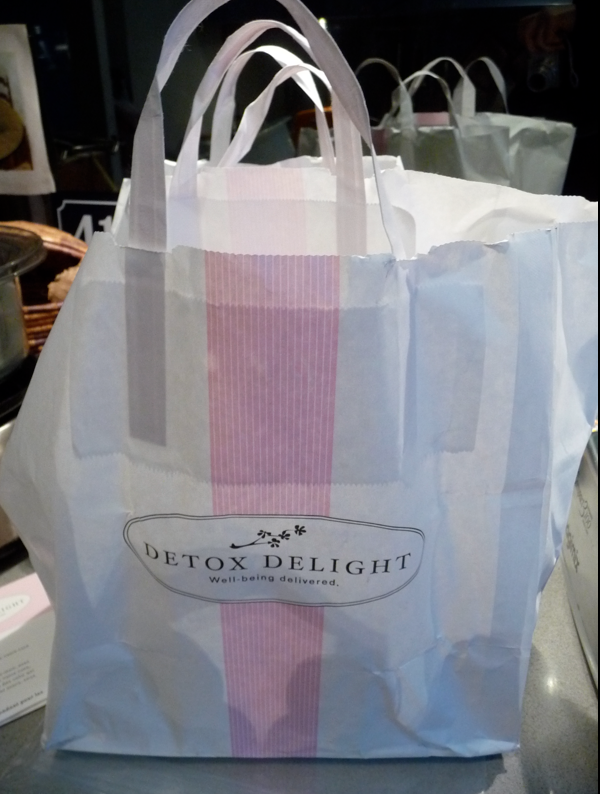 A few weeks ago I wrote about my first delivery of Detox Delight. I had committed to a 5 day juice fast and I was excited about trying a new, healthy experience. I was hoping to shed some weight, and be one of those cool people who can say, “Oh, yes, I’ve done a detox.” It sounds so enlightened, n’est-ce pas? Like the American expat I met last month who went into ecstasies about the 43 liquid fast she’d do every year when she lived in the US. I was totally impressed as she went on about the evolution and how your body adapts over time. I asked why she’d stopped her annual tradition. But exactly how enlightened was I? Or rather, how light had become? First of all, let me say that I cheated. On the evening of the fourth day we had a dinner date that had been planned months earlier. There was no way I could cancel, or re-schedule. But with that one exception, I stuck to the program. I loved the first few days, feeling virtuous and all that, but by day three, my mouth was craving texture, my taste buds crying out for some variety, I wanted to cry each evening as I prepared the family dinner (yes, I still had dinner duty). What saved me was the authorization to eat a piece of dried fruit or a few nuts each day. I’d cherish my little snacks like precious gem stones. The results? I lost 2.5 kilos, and put 1 back on almost immediately. The rest has stayed off despite a ski holiday that included a daily tea time treat, 6 units of alcohol and 1 fondue dinner. Which kind of gives you an idea of the true results; I am healthier. 2/ I’ve gone dry. All that drinking has me thinking about what I do drink, so my alcohol consumption has gone way down. On holidays I had the equivalent of a drink per day, but in Paris its now closer to 2 drinks per week. The hardest part was learning how to get around social drinking. At my “cheat” dinner, I had to excuse myself and explain why I wasn’t having an apéro. You’d have thought a green head was growing out of my left shoulder by the expression on their face as I explained the concept of Detox. 3/ Bye bye bread. I’ve nearly cut it out of my diet. Unless its an integral part of my meal, like that fondue I had in the Alps, a pulled pork sandwich from a local wine bar, or perhpas the wrappers around the gyoza I’ll be having for lunch today. I am not eating bread after breakfast and I am avoiding starches all together. Proteins keep me from being hungry, vegetables fill me up, so this seemed like the easiest thing for me to cut back on. 4/ Veg-o-rama! I was a vegetarian for much of my adult life. Then I moved to Paris and became a confirmed carnivore. I even love a good tartare now! 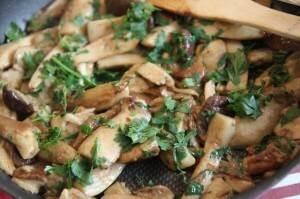 But French cuisine is not a big fan of vegetables, considering both beans and potatoes a worthy substitute. While a hearty cassoulet is a scrumptious feast, and is just what the doctor ordered for hearty men working out in the frozen fields from dawn until dusk, it is not exactly on my prescription sheet, so I am re-learning to build my meals around foods that recently had roots. I am loving all the healthy influences of Detox Delight, but those five days were torture for an undisciplined gal like me. Next time I’d be tempted to choose their option that includes salads, and foods with textures. But I think the best solution for me would be a weekly Detox Delight, allowing me to clean out my system and reminding me to stay on track for the rest of the week, month, year! Its mushroom season, and I am a girl with a thing for fungi. Truffles, chanterelles, morels, girolles, it all make my head go into a spin and my mouth start watering. Right now the markets have baskets over flowing with cèpes, the large fat mushrooms (sometimes crawling with worms) that look something like a porcini and are simply heavenly. Sunday Mr French went out for a baguette for our lunch and came back with an entire kilo of the little beasties for our dinner. I was over the moon, not only would be I be having one of my favorite treats, but I would be offer dinner duty. I knew this because I have been banned from being anywhere near the spore bearing plants and an open flame. Something about my energy instantly turns them into a rubber mush, disappointing everyone, especially me. Mr French has tried to teach me how to prepare them, but I simply can not seem to learn. And maybe I don’t want to, because it is kind of nice being served your favorite dish from time to time. This week I was granted kitchen access on the condition the camera stay in my hands at all times and I touch nothing related to food. So this is how you prepare a poêlée de cèpes bourgignon. 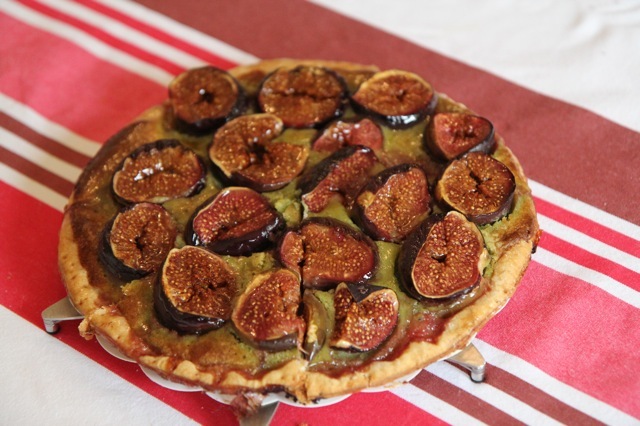 The bourgignon part is important, because that means you get to serve it with wine. Carefully select a kilo of the beauties (any ‘shroom will do, doesn’t really have to be cèpes). Wash them lightly and brush off the dirt. If they’re large, cut them in 1/4. 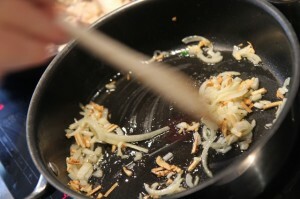 Then dice up an onion, 2 cloves of garlic and a bunch of flat leafed celery. Sautée the onion and garlic in a pan until almost golden. Set aside. 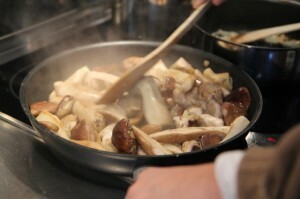 In another pan, sautée the mushrooms at high heat. This is important because they give off a ton of water. In fact, that is where I ruin the dish. 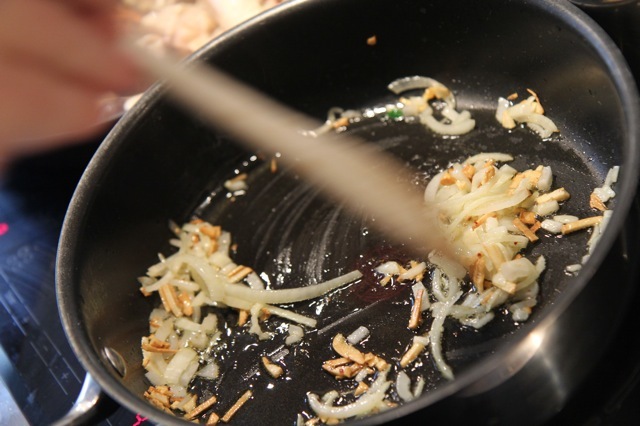 I forget to drain the pan from time to time, removing any excess liquid. 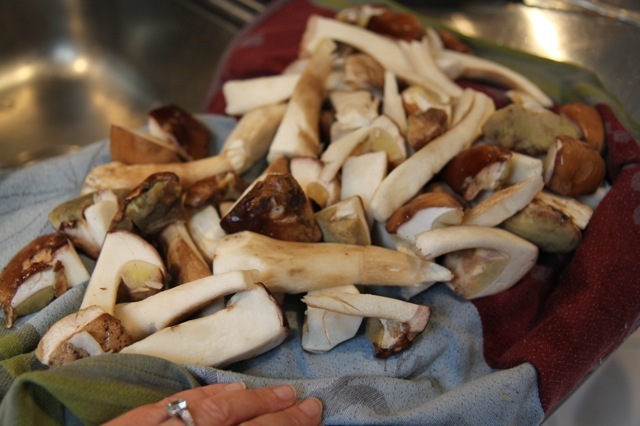 If you do this into a small bowl you can then save the ‘shroom juice for a risotto some other night. But if that’s complicated, but be sure to drain regularly. Just as the mushrooms look done, toss them in the pan with the onion and garlic. 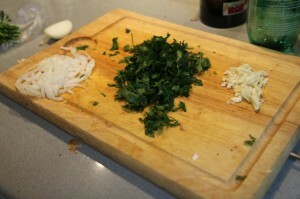 Heat through and sprinkle with the parsley.